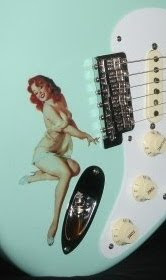 Fuller's Vintage Guitar currently lists this wonderful wino 60th Fender Anniversary Custom Shop Strat for the SERIOUS COLLECTOR. 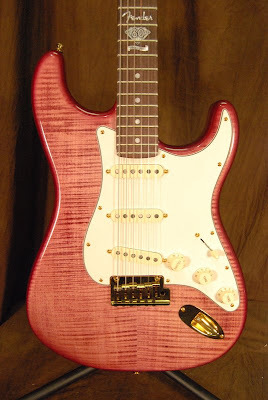 The "wino" part describes the genuine Cabernet stain finish on the AAA maple top, ash body. As per the original release, Fuller's unit also comes with the case of Hill Family Estates Vineyards Cabernet which also commemorates Fender's 60th Anniversary. All the original case candy is present and accounted for as well. These were originally released at the January 2006 NAMM, so the wine has a couple more years on it. But wait folks! If you're really serious, you won't wanna miss our Vice Presidential Hunting Skills Commemorative Edition, "The Dickwood".